Welcome to what we hope is a long journey in Real World Clouds. Over the past 6 years, we’ve both personally seen much change in this space but one thing that we felt was definitely missing in the blogosphere, were answers to real customer questions. In this series, we’re hoping to showcase some of the complex integrations and advanced services that can be built using the vRealize Suite. Our goal is to get you setup with blueprints and then discuss all the nitty gritty details around service design. With that said, let’s get started. First of all, this is not a beginners series. 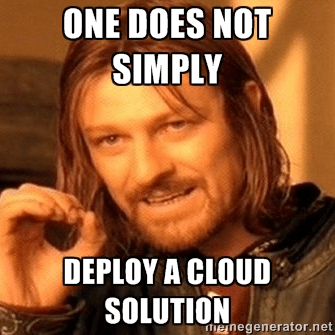 You will absolutely need to have vRealize Automation 7 setup and configured. We also assume you already know what Business Groups, Reservations, Entitlements, etc. are. Some of these items will be recapped as needed, but if you want a great getting started guide on vRealize Automation 7 there are several great resources at the www.theithollow.com by Eric Shanks and http://www.virtualjad.com by Jad El-Zein. Last, but certainly not least, are other great vRO/vRA Websites like vCO Team, and many others. vRealize Orchestrator (vRO) is going to be the basis for a number of the subsequent posts. Don’t worry if you aren’t 100% versed in vRO just yet. We will walk you through all of the workflows in detail and I’m also in parallel working to publish a pluralsight class (https://www.pluralsight.com/) on developing workflows with vRO. We will be focusing primarily on VMware vSphere 6 in this series. It is assumed you already have a base understanding of vSphere and vCenter.